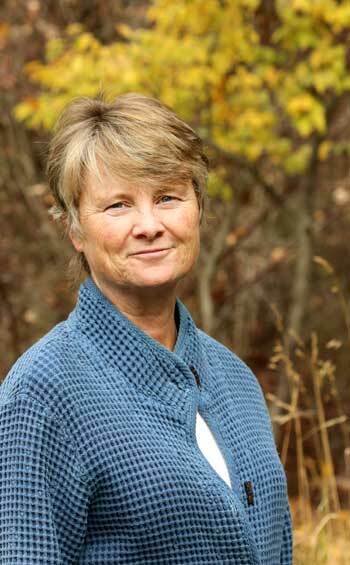 Janine Benyus is the co-founder of Biomimcry 3.8 and the Biomimicry Institute. She is a biologist, innovation consultant, and author of six books, including Biomimicry: Innovation Inspired by Nature, in which she named biomimicry, an emerging discipline that emulates nature’s designs and processes (e.g., solar cells that mimic leaves) to create a healthier, more sustainable planet. Why design like nature? Why is nature’s approach necessarily the best? Life has been on the planet for 3.8 billion years, and, in that time, it has learned what works and what lasts here on earth. That’s a long line of good ideas. Unprecedented longevity. What doesn’t work is recalled (made extinct), and what does work is optimized with each generation. Natural selection prizes those things that work best in place as well as those that create conditions conducive to life. What we see now is a scant one percent of the species that have been on earth; they’re the best of the best. Their design solutions have been created in the context of our planet. They’re designed to tap the power of limits and make the most of opportunities—it’s a dance within the creative frame of what’s real. Organisms that tap the limits and opportunities of their habitat excel and get to stay there. This method creates context-shaped adaptations—technologies—that are earth savvy. We call this portfolio of adaptions “biological intelligence” for a reason, because there’s an embodied wisdom to these designs. When you ask “why design using nature’s principles and patterns?” I think it comes down to this: They just really work well on this planet in a no-regrets way. Unintended consequences? Already shaken out of the system. I can’t think of a better model. How has the biomimetic design movement evolved over the past few decades? Where did it start? How did you get here? What happened along the way? In the last few years, biomimicry has moved from a meme to a movement. When I wrote Biomimicry: Innovation Inspired by Nature in ’97, the idea of looking to nature for innovation was just a faint signal in the literature. I found a few articles on leaf-inspired solar cells, prairie-inspired agriculture, spider silk and fibers, and ecology-inspired businesses, but these ideas were published in bizarre, seldom-read journals. In 1998, Dr. Dayna Baumeister and I created this company of biologists (Biomimicry 3.8) that brings biological intelligence to innovators. We thought it was going to be about product design and engineering, which it is. We’ve created products with everyone from Boeing to Nike to Green Mountain Coffee Roasters to GE, General Mills, Interface, Procter & Gamble, and Kimberly-Clark. 250 clients. Lots of Fortune 50 companies now. We solve their toughest sustainability challenges and we train companies to practice biomimicry thinking. But there was also interest in bringing biomimicry to the built world. Jane Jacobs was the first one who had me speak. She called me out of the blue. I had been a fan of The Death and Life of Great American Cities when I was in college, not because I was an urban planner, but because I was a writer, and her bell-clear essays taught me to write. When she called me, I was shocked because I assumed she had passed! But no—at 80-something, she had just read Biomimicry and was handing it out as Christmas presents. She was writing a new book with a “biomimic” as the main character. And then Bob Berkebile asked me to speak at the AIA Environment conference. And it just went from there. Clients like HOK and Gensler hired us, and we looked at how to apply biomimicry at the building, landscape, and all the way up to the city level. In 2006, we created the non-profit Biomimicry Institute to get tools out to people and give people an opportunity to practice biomimicry through design challenges. Now we have AskNature.org, a global network of 31 hubs, and we’re on our 6th year of Global Design Challenges. Our latest challenge — food systems— attracted close to 2,000 people from 71 countries. Biomimicry’s gone from a meme to a movement because it just makes a lot of sense to people. It’s a whole new discipline debuting for the first time in universities, industries, and the zeitgeist, and that doesn’t happen very often. People are now painting out the canvas of biomimicry. We’ve had engineering, architecture, city planning, computing, medicine, chemistry, robotics, product design, even finance using models from nature. Now it’s biomimicry for social innovation—management, leadership, and organizational design—that’s a new focus area. What are the most exciting areas of biomimetic design and innovation today? What has the potential to be truly game changing? You can’t talk about changing the game without first rescuing the game. Of the climate change mitigation strategies now being vetted, the ones that float to the top for us are two biomimetic ones. The first strategy is bio-sequestration, which is figuring out how to get the carbon currently in the atmosphere stored in deep soil profiles. The way to do that isn’t through industrial agriculture or industrial forestry; it’s through ecosystem-inspired land use — farming and ranching and forestry in nature’s image. Ecosystems store carbon in spades and so do these emulations. I think the design principles involved in this bio-inspired land management are applicable to landscape architecture. Landscape architects are already starting to create multi-functional landscapes. But people are going to ask a lot more of their green spaces, particularly in cities. They’re going to be looking for ways to pull carbon down. Because we’ve lost half of the carbon in our soils over the past 200 years, we’ve got this half-full bathtub that we can fill with carbon. When you start looking at the UN Intergovernmental Panel on Climate Change (IPCC) reports, they support nature-inspired mixed species agriculture or polycultures. They support agro-forestry—putting trees together with crops. They are starting to say one of the most promising tactics is rotational grazing—moving cows around the way buffalo used to roam in herds then move on. This process creates really deep-rooted grasses that place carbon way down into the soil, feeding the soil microbes and therefore storing carbon. This was seen as a wild-eyed approach when I first wrote about it. Now, it’s considered to be one of things we must do to reverse climate change, right alongside eliminating greenhouse gas (GHG) emissions, and moving to clean energy and wise energy use. Once we’ve stopped the madness of emissions, there’s still the final piece of the puzzle—pulling down what we already emitted. Another biomimetic strategy is capturing carbon dioxide in useful products. We can now create carbon-storing concrete based on coral reef recipes, because corals have been storing CO2 in concrete-like reefs for a long time. We can use carbon “pollution” to create plastics that are 50 percent carbon dioxide. There are eight companies now mentioned by IPCC that take CO2 and store it in polymers, as well as concrete and building products, like the firm Blue Planet does. This year’s XPrize is called Carbon X. There will be $20 million available for teams who can take CO2 and turn it into useful products. Now why is this process biomimetic? Plants turn CO2 into sugars, starches, cellulose. And that’s a trick. The reason we use CO2 in our fire extinguishers is that it doesn’t really react very well—it’s hard to turn it into something else. You either have to add lots of energy, or have a super enzyme to make CO2 hook up into long carbon polymer chains. But plants and corals and mollusks do it all day long. Suddenly, nature’s recipes for turning CO2 to stuff or fuel becomes essential in carbon dioxide sequestration. It’s classic biomimicry, and this time, it’s helping us reverse climate change, making use of the 200 years of our carbon exhalations. Another area that excites me is this concept of the circular economy, the idea that instead of sending stuff to landfills, we can recoup and use materials, mimicking flows in the natural world. This comes at an auspicious time, because with 3D printing, manufacturing is about to come home, and it would be great to use local feedstocks. When print shops are on every retail corner, products won’t cross the globe but designs will. I’m excited because biomimetic structural blueprints are a great way to take common raw materials and make them functional. Life’s structures are very detailed in terms of their internal and external architecture. Think of animal shapes that reduce drag and shed water on the outside, but on the inside have this intricate cathedral of bone, strong but lightweight because of the design. 3D printers’ algorithms—generative design files—are increasingly going to come from biology. 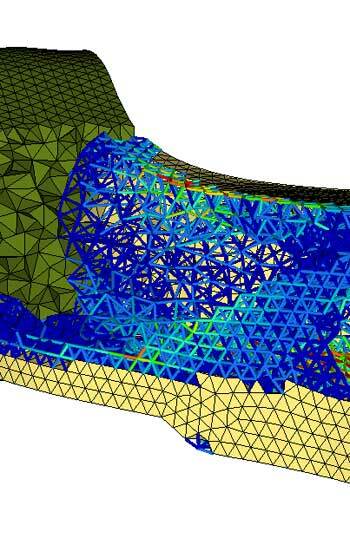 One of the major optimizing technologies for buildings right now is a software called OptiStruct, which is based on a bone algorithm. The technology mimics how bones lay down material where it’s needed along lines of stress and take a material away from where it’s not needed. These bone algorithms are now seen in bridge and building beams, and they were used to lightweight Airbus’ new rib and wing assembly by 40 percent. Beyond shape, I think nature’s low-temperature, low-toxin chemistries are also going to be important—safe chemistry in the printer, and bio-inspired dis-assembly chemistries—so we can return products and print them into something else. On AskNature.org, you have both animal and plant-based strategies. The plant-based ones are equally as fascinating. What are some key things plants can teach landscape architects about how to design? Plants are star players in the water cycle, but there are things we are just now learning about them. A decade ago, climate scientists were trying to solve a conundrum. 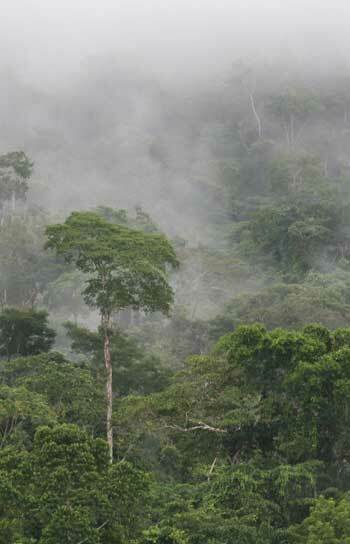 How is that rainforests still produce clouds above the trees in the dry season? Where are they finding moisture to transpire into clouds? It’s called hydraulic redistribution, and here’s how it works. A few shrubs in rainforests have deep tap roots and shallow roots. In the rainy season, the shallow roots soak up the rain and direct it down the taproot and out into deep soils, where it’s banked for later use. Come dry season, the reverse happens. The tap root draws the water up and releases it from the shallow roots so that other organisms in the forest can access it. Ten percent of all the rainfall in the amazon is redistributed in this way. I can see a time when landscape architects would plant a few “bio-irrigators” in their mixes, so that even in the dry season, water can be pulled from the soil vault, and then redistributed via shallow roots. It’s a self-irrigating landscape. I love that. Plants also show us how to extract water from the atmosphere. 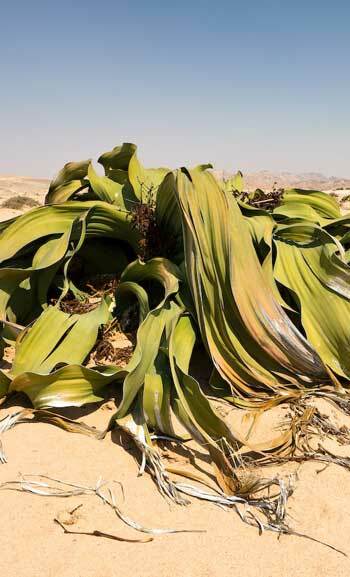 In the Namib Desert, plants comb moisture out of really dry areas that sometimes get some fog. Redwoods actually do it, too. A University of California at Berkeley researcher named Todd Dawson showed that a hundred foot redwood will gather the equivalent of four inches of rainfall from fog in a single night. The water condenses on its needles and drips down. That’s an enormous amount of water. Plant-like water pulling, and the process of condensing of dew and channeling it down to the roots, could be transformed into engineered landscape solutions. Plants are incredible in how they move water, too. They move water in very thin columns, like thin straws, through capillary action. You would think these straws go straight up the trunk of the tree, but that’s not what happens. In trees, the bundles of straws form a thin sleeve, a cylinder just under the bark. Some straws transfer sugars down to the roots (phloem), others transfer water up (xylem). Interestingly, these straws don’t go straight up and down; they wrap around the tree in a spiral from the base to the top. This means that if you lose one whole side of the root network—say it gets cut by construction equipment—the tree doesn’t die. If the straws went straight up from the roots, all the branches on the damaged left side of the tree would not be serviced with water. Thanks to the spiraling xylem, the water from the right-hand roots are swirled up and around to reach every branch. Now, that’s resilience. And plants don’t have pier foundations; they have horizontal roots. There’s a new Engineering Research Center for Bio-mediated and Bio-inspired Geotechnics at Arizona State University, which just received several million dollars from the National Science Foundation. One of their projects is to better understand the way roots hold trees in place on steep hillsides in order to help them redesign low-impact foundations. There’s a lot of brilliance in trees. How can biomimicry be scaled up to the city level? What natural systems can we mimic to make our cities more efficient and livable? We decided that a biomimetic city should be functionally indistinguishable from the wildland next door. It should produce beneficial services just like the native ecosystem, because, after all, biomimicry is not about how it looks, it’s about how it functions. We started to look for nearby reference habitats that show us what would be growing here if we weren’t here. We found remnants of prairies or forests or wetlands that were relatively intact. We could measure how they’re performing today, not historically. What we measured are the things that matter most to people — they are called ecosystems services. They’re things like purifying water and storing water, retaining soils from erosion, supporting biodiversity and pollinators, managing pests, all these things forests and other natural systems do for us. We focused not on economic values (though that could come later) but on quantities. How much carbon is being stored per acre per year? How much water is being stored in a storm? How much air and water are being purified? How many nutrients are cycled? How many degrees of cooling happen? How much soil is created? We use biological literature paired with GIS models to get those quantities on a per acre per year basis. Then we say to the city managers and planners, or even people in the district or a block: here’s a new performance metric. Can your acre of development—buildings and sidewalks and streets and green landscapes combined—perform as well as the equivalent acre of wildland next door? We call them “ecological performance standards.” Now it’s not just a matter of providing ecosystem services in a metaphorical way—it’s a matter of meeting or exceeding local, measurable amounts. It’s an incredible, aspirational goal that we know is doable because it’s happening right next door. I like it because it’s locally relevant and because it gives communities a framework to design into. Once a visionary city signs off on these metrics, every design intervention–every green roof, every foot of permeable pavement, every self-watering landscape—would add up. Cumulative goodness. All by asking the question—how much should this city give back to the region around it? Together, the city has a goal, and that can be met through retrofits or new build. Each building has a goal. The block has a goal. The district has a goal. Finally, we can see what all our design interventions do together. If we want a city that functions like a local ecosystem, this gives us a way to actually do it. Imagine a city achieving, and then celebrating, these milestones as a community. 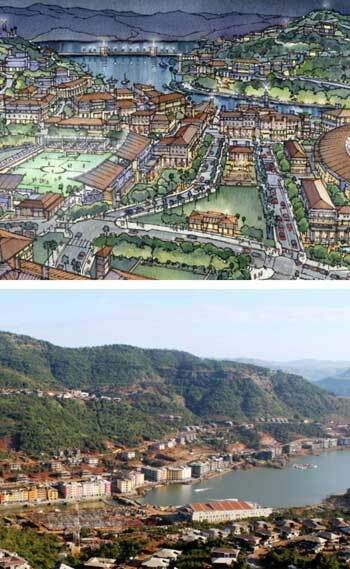 For a project in Lavasa, India, we created ecological performance metrics for a new development southeast of Mumbai that will need to provide for five new urban villages with some 30,000 to 50,000 people. We worked with HOK to create a master plan but also a landscape master plan that can handle stormwater during the monsoon seasons, which cause a great deal of soil erosion. In a three month period, the area gets 27 feet of water, but in the Western Ghats forests next door, there is negligible erosion! The landscape architects at HOK were greatly excited by this challenge. They said they felt like they were back in school, up all night, researching how they could create a planting design that would result in 100 percent soil retention. We provided the ecosystem performance metrics, but the landscape architects came up with a plan to achieve it. Returning to ecosystem-based agriculture, how much of our climate problem could be solved by storing carbon deep in the soils? What will it take to get to a more sustainable global agricultural system? Just improving energy efficiency is not going to take out the carbon that’s currently in the air. That carbon will be there for centuries unless we find a way to recoup it, to “bring it back home,” as environmentalist Paul Hawken says. With Project Drawdown, he and his colleagues are modeling 100 possible strategies for mitigating climate change between now and 2045. The data is not all in, but it looks like the top 20 strategies are doing a lot of the work. Of that 20, bio-sequestration—deep roots driving carbon below the churn zone where it can stay put for centuries—is a large player. It’s not a silver bullet; it won’t replace slashing emissions or moving to clean energy, but it could be a big contributor to what we actually have to do, which is reverse climate change. The 2014 IPCC Framework for Policymakers was definitive: even if we cut emissions completely, we will still be dealing with the effects of climate change for centuries, if not millennia, unless we pull the carbon down. I sense that large industrial farmers will only begin to store carbon when they have monetary incentives. 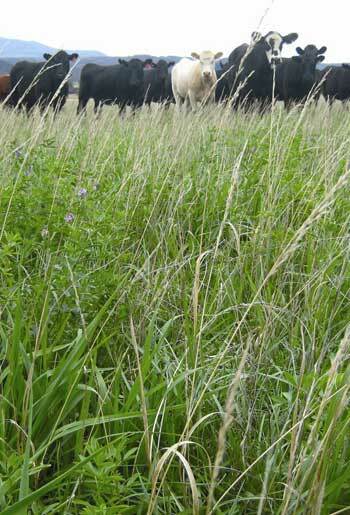 Once a market for sequestering carbon dioxide appears, land management regimes may change. But industrial farmers are not growing most of the food that the world eats. People don’t realize that 70 percent of the food eaten around the world is grown by a third of all humanity who are called smallholders. They farm on less than 5 acres, and often, by necessity, they are still growing organically—no purchased fertilizers or pesticides. The food and beverage industry is increasingly relying on these smallholders to provide the organic ingredients we crave. Suddenly, there’s a small group of intermediaries that could request healthy soil practices from their suppliers. And that’s where we as consumers come in. We’re already prescriptive about how our food is grown. We ask, “Does it contain GMOs? Does it contain hormones?” Years ago, I would never imagine we would be so discerning about the story of our food. Climate-friendly farming is just another layer of that. The push for this could come from consumers and from an economic market for carbon. So when I look at the mitigation landscape, I see biomimicry starring in some of the newest plans to draw down carbon: prairie-inspired agriculture, agroforestry, ungulate-inspired rotational grazing, and the whole realm of CO2 to useful products. We’re at the beginning of a quest to grab every carbon dioxide and methane molecule we can find. It’s going to happen in cities, too. Why not have Central Park get credit for carbon sequestration services and healthy soil creation? And besides being a vital contributor to reversing climate change, a generous city is just a better, healthier, more beautiful place to live. That’s why biomimicry at the systems level is looking so sensible—it’s just good, no-regrets design. Next Article Which Aspects of Nature Improve Our Health?